It was with great pleasure that Cashel Community School welcomed the All Ireland U21 Hurling and the Munster minor Hurling trophies, along with past pupil Ger Browne (u21 player) and current students Eoghan Connoly (u21 player), Aaron Browne and Conor O Dwyer (minor players) to the school recently. The school sports hall was decked out in Blue and Gold, and the full school body showed their appreciation to the 4 winners, on what was a great occasion for everyone present. Gamesmaster and GAA Coach Brendan Ryan outlined the fantastic contributions of Ger and Eoghan to Tipperary’s U21 success. Ger was praised for the leadership he displayed throughout the campaign, scoring 1.9 from play from his midfield berth. This leadership, along with a huge level of skill and speed, was always evident when Ger lined out for any school team he played for during his time in CCS. This was the 2nd time that Ger returned to CCS with a national title, having returned in September 2016 after winning an All-Ireland Minor Title. Brendan Ryan then praised Eoghan Connolly, who broke into the team after the Munster final loss to Cork, and was such an important player in both the All-Ireland semi-final and final. Eoghan’s achievement was all the greater considering how young he is, and if this competition stayed at u21, he would amazingly have 3 years left to play at this grade. Eoghan was praised for the leadership, commitment and honesty, which brought him to Liam Cahills attention, and is evident everytime he wears his club and school colours. Aaron Browne (Gers younger brother) and Conor O Dwyer were also saluted for their important roles in Tipperarys Munster minor hurling victory. Aaron played every minute in Tipperary’s six championship games and won many admirers for his quality goalkeeping. Conor was one of only three players who were u16 on this minor side and played all games at corner back, using his pace and determination to great effect in each game. Principal John Gallagher congratulated all four winners, explaining how proud CCS were of their achievements. 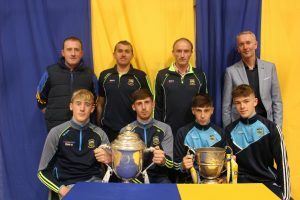 West Tipperary GDA Kevin Halley also saluted Ger, Eoghan, Aaron and Conor on their achievements, and praised CCS for the important role they have played, and continue to play in these players development as hurlers. All speakers wished the players and all school teams well in the year ahead. Here’s hoping that the school will have many more of these great celebrations ahead. Back: Kevin Hally (West Tipperary GDA), Mr Brendan Ryan (Gamesmaster), Mr. T.J. Quinn (CCS) Mr. John Gallagher (Principal CCS). Front: Eoghan Connolly, Ger Browne, Aaron Browne & Conor O’Dwyer.